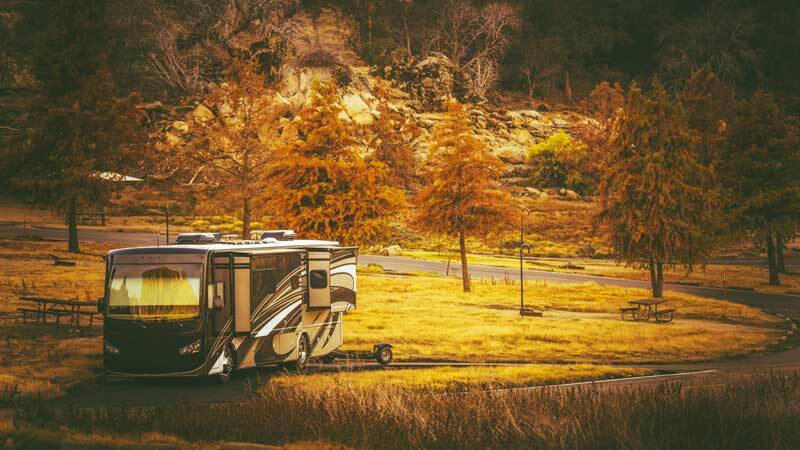 In this guide, we will discuss the classes of RVs, share tips for choosing one that will fit your needs and offer our detailed evaluations of the RV top companies. Tiffin’s warranty covers 10 years on the frame construction, five years on fiberglass delamination or wall separation, one year or 12,000 miles comprehensive coverage, one year of 24/7 roadside service and ongoing owner support for as long as you own your RV. 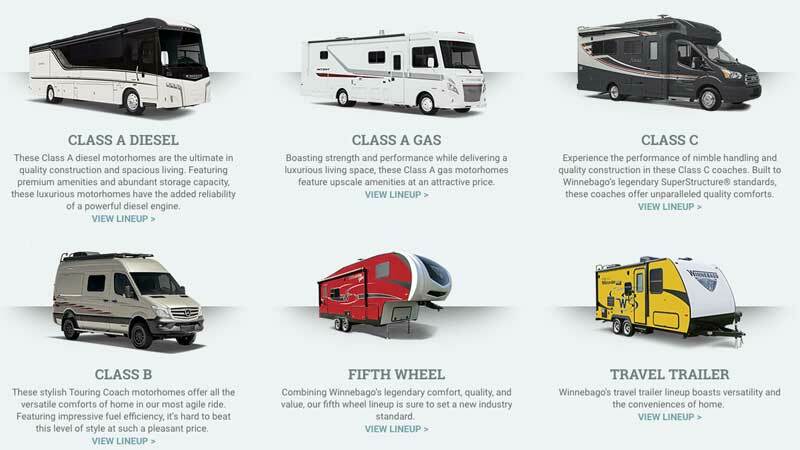 If you’re looking for a broad selection of RVs to choose from, Winnebago has nearly 30 models. Winnebago RV models include Class A, B and C RVs, travel trailers, and a fifth-wheel RV model. Prices range from as low as $21,153 to over $250,000. Jayco RVs have added protection against extreme weather thanks to their Climate Shield system. All RVs are tested in climate-controlled facilities by independent technicians. If you’re looking for a tough RV, Jayco RV models start at around $85,000. Known for their sleek, silver design, Airstream offers nine models of fifth-wheel travel trailers ranging in price from $37,400 to $152,000. It also makes five models of Class B touring coaches costing around $149,240 to $221,000. RV Industry Association reported that RV shipments in 2018 topped 33,000. Towable RVs lead the way over travel trailer RVs. We evaluated 12 RV manufacturers and after in-depth research found four that stood out after we compared what each recreational vehicle company has to offer. Categories we used in our consideration included class, size, amenities, options, price, warranties, ratings and ease of operation. The RV manufacturers that ranked highest are Airstream, Jayco, Tiffin, and Winnebago. In this guide, we will discuss the classes of RVs, share tips for choosing one that will fit your needs and offer our detailed evaluations of the top companies. You will also find helpful frequently asked questions about RVs in this guide. Before settling on a specific RV class, make sure your state doesn’t have any particular driver’s license requirements. Know the type of RV lifestyle you want (occasional travel, live in it full time, room for guests, etc.) to help narrow the field when you shop. Keep in mind that an RV may be a home on wheels, but its value depreciates just like any other vehicle. Investing in an RV isn’t just about a monthly payment and fuel charges. Other things to keep in mind are insurance, maintenance, repairs, parking fees, cleaning, food, entertainment and how you’ll get around daily in areas you visit. Before you start shopping for an RV, decide how you want to live while traveling, how long your trips will be and who will be living with you. Make these decisions first to help you determine what you need to live comfortably on the open road and be the foundation of your search for the perfect RV. Will you need all the comforts of home or just the necessities? Weekend warrior or full-time traveler? Driving solo, with a partner, with kids or grandkids? There are three classes of motorized RVs: Class A being the largest, Class B being the smallest and Class C is sized somewhere in between. The towable classes expand the playing field by adding in travel trailers, fifth-wheel trailers and several smaller and specialty trailers. There are five types and classes of RVs you need to know about before starting your decision making process. Class, A, B and C, travel trailers and fifth-wheels. Class A: Class A RVs are built on either a truck or commercial vehicle chassis, a specially designed motor vehicle chassis or bus chassis. 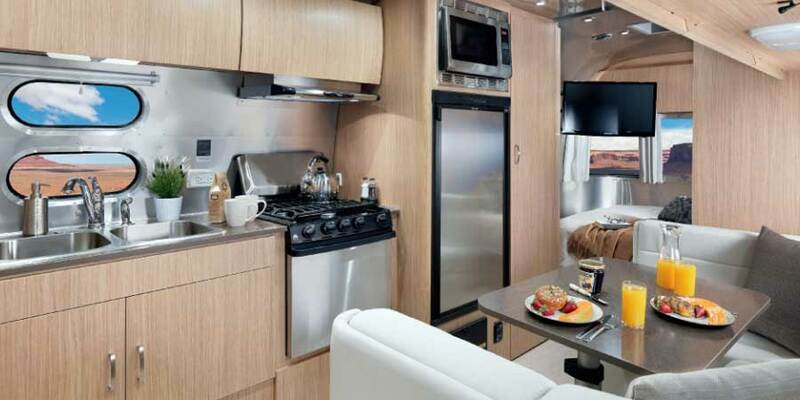 They’re the most luxurious RV on the market and offer the most amenities including slideout side panels. The living area is easily accessible from the cockpit. Class B: Class B RVs are built on conventional van chassis and sometimes include a raised roof or a re-built backend for a low-profile body. Class B RVs are sometimes referred to as “campervans.” In the United States, Class B RVs are built on different chassis depending on engine design and the RV manufacturer’s preference. Common chassis include Mercedes Benz Sprinter diesel, Dodge Ram Promaster and Chevy Express. Class C: A Class C RV is built on a minimal truck chassis and has a rigid weatherproof structure that’s attached to the original cab and chassis that’s used for living quarters. Class C RVs are most notably known for their “overcab” sleeping space or storage space. Travel Trailers: As the name suggests, a travel trailer is pulled by a truck, SUV or van using a hitch. They come in different sizes and their living spaces are made of rigid weatherproof material. A popular, lightweight travel trailer is known as a teardrop trailer. Teardrop trailers are small and compact, usually having enough room for two people to sleep, and can be pulled by lighter-weight vehicles. Fifth-Wheels: Fifth-wheel trailers are RV trailers made with a special in-box hitch called a fifth-wheel coupling. They’re distinct because part of the trailer body extends over the bed of the truck hauling the trailer. The biggest downside to a fifth-wheel trailer is the fact that the hitch mount takes up more space in the box when compared with a traditional trailer hitch. If you want to un-hitch your trailer in a remote location so you can use your vehicle, it is more of a hassle. See our chart below to get the measurements, costs and how many people you can expect to sleep in each type of vehicle. Cost factors include much more than just sticker price. First, understand that you’re adding expenses to your monthly budget if you are a part-time RV dweller, and you’re trading one set of costs for another if you become a full-timer. Second, bigger RVs mean larger living spaces, more storage space, and higher fuel and insurance costs while smaller RVs are less expensive but have less living and storage area. Third, even if you plan to be on the road full-time, you’ll need to select a state of domicile for insurance and tax purposes. Our comprehensive Taxes by State Guide gives you the information you need to decide if you should try to establish residency in another state to save on taxes. There are nine states with no state income tax: Alaska, Florida, Nevada, New Hampshire, South Dakota, Tennessee, Texas, Washington and Wyoming, but you’ll want to check to see what the residency requirements are before choosing one as a new home base. There are pros and cons to buying new or used RVs. A new RV comes with a warranty and a higher price and insurance premiums. The cost of a new RV may be worth having no concerns about problems that may have developed over the years in a used coach, and you will have more customization options. A used RV is less expensive, and the insurance payments run lower, as does the depreciation rate. Your choices for customization will all come after the sale, adding to upfront costs. Finding hidden issues are a possibility when custom features are installed in a used RV, just as can be the case when you remodel an older home. RV warranties can vary a great deal from company to company. Ask about regular maintenance you need to do to keep your RV and systems running well, and what is required to avoid violating the warranty terms. Find out about the availability and cost of service and support in your area and in the areas you plan to travel. There are many well-known manufacturers of recreational vehicles, better known as RVs. Deciding on essential features and “dream features” and knowing available options is only the first part of the search. Fine tuning all of the information to find the best deal and then signing on the dotted line to embark on your adventure can be fun, but it can also be tedious. Luckily, we did the hard work for you. Our in-depth analysis focuses on each company’s industry reputation, the variety of offerings and other criteria. We researched the top 12 companies that manufacture RVs. Then we narrowed the list to our top four based on specific criteria we set by extensive research of government and consumer information. The result was a list of four of the top RV manufacturers. After our evaluation, we chose the best RV manufacturers. Each of these companies stood out above and beyond the competition. Bob Tiffin’s dream was to design the kind of vehicle he would want to drive as he traveled with his young family. In 1972, the first Tiffin RV, the Allegro, hit the open road and over 50,000 coaches later, Tiffin has one of the best manufacturer’s warranty in the industry. 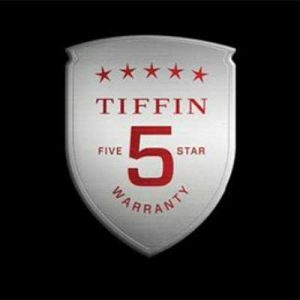 Tiffin’s warranty covers 10 years on the frame construction, five years on fiberglass delamination or wall separation, one year or 12,000 miles comprehensive coverage, one year of 24/7 roadside service and ongoing owner support for as long as you own your coach. Tiffin’s 2019 RV model lineup includes six Class A coach models and one Class C coach. Dealers in the U.S., Canada, Australia and New Zealand carry the Tiffin line, and you will find authorized service centers throughout the U.S. It’s higher end, Class A RVs range in price from around $215,000 to over $330,000. From the luxurious high-end Grand Tour Diesel to the compact yet functional and affordable Minnie Drop, Winnebago has something for everyone regardless of the budget. You can comfortably live in a four-season RV in any weather. Unfortunately, there are no industry-wide criteria that designate an RV as being genuinely suitable for all types of weather, and some do so much better than others. 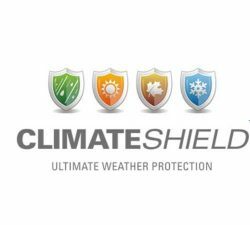 Jayco comes out on top with their Climate Shield, a system that protects against extreme temperatures ranging from 0 to 100 degrees Fahrenheit. Jayco has tested their vehicles in a climate controlled facility by independent technicians. Eight hours of extreme heat and cold resulted in an interior temperature of 71 to 68 degrees Fahrenheit, respectively. Jayco’s 2019 RV lineup includes over 25 RV modles, from travel trailers to Class A motorhomes. They start at around $85,000 and go up from there. Airstream’s 2019 Interstate Touring Coaches start at $149,240. All models come with 50 standard features, including fog lamps, Bi-Xenon headlights, heated windshield and power mirrors, touch screen NAV/SAT radio/DVD system, rear and side view camera monitor, Dupont Corian tables and countertops, parking assist, rain-sensing windshield wipers and blind spot assist. Their “Build your Coach” option allows you to select everything from paint colors to floorplans and cabinet styles to fabrics, making Airstream our top pick for most customization options. Airstream’s 2019 travel trailers come in 9 styles and sizes: Classic, Globetrotter, Tommy Bahama, International Serenity, International Signature, Flying Cloud, Sport, Nest and Basecamp. Starting with the Classic, these models sleep up to five people and as little as two people for the Bascamp trailer. Airstream travel trailers range in price from around $37,400 for the Bascamp, up to $152,400 for the Basecamp. What types of amenities can I expect in an RV? Entertainment packages that include TV, radio, etc. Optional amenities often include automatic entrance steps, stackable washer and dryer units, generators, solar panels, larger kitchen appliances, sleeper sofas, ceiling fans, sunroofs or skylights, queen or king-size beds, satellite systems and upgraded finishes. How can I get internet access on the road in an RV? Many RV parks offer wifi for a minimal charge or for free. On the road, satellite internet is usually a pricey option but gives you internet access in even very remote areas. Cellular internet is the third option, and it works well for many RV enthusiasts, especially with the big cell companies offering unlimited data and hot-spots. Workamping is a term that combines work and camping, and it’s a way to make money while still enjoying long treks on the road. Tens of thousands of retirees stretch their pensions, savings and social security by taking on jobs at campgrounds or government-owned parks in exchange for a paycheck or a free or highly-reduced campsite. Workamping jobs are seasonal, and some RVers find work at places like amusement parks and produce stands, mainly if they will be staying in one place for awhile. What is the average monthly cost of RVing? the answer to that question depends on the type of lifestyle you live on the road. For full-timers, the average runs about $2,200 a month. If you’re living “off the grid” in a remote location with no utility hookups, you’ll spend much less. Planning to stay at a luxury RV park could set you back $120 to $165 a night depending on the season and location. If you find a place you adore and stay for a while, your fuel costs will be much lower than logging miles several times a month. Where can I travel in an RV? You can spend your golden years nearly anywhere doing almost anything in your home on wheels. Parks and campgrounds are located all over the country so you could have a white Christmas in Colorado, 1,400 varieties of flowers at the Great Smoky Mountains National Park in the spring, spend summer at a beach, and see gorgeous fall foliage at some of the most beautiful spots in the country. And, getting there is half the fun. The U.S. DOT’s Federal Highway Administration lists America’s Byways, 150 distinct and diverse roads designated by the U.S. Secretary of Transportation, which includes the National Scenic Byways and All-American Roads. Regardless of which company you choose for your RV purchase, don’t hesitate to ask plenty of questions about price, features, service, and reliability. Our four picks for RV manufacturers cover most markets and offer a wide range of excellent models. Combine what you have learned from our guide with some research and recommendations from friends or trusted local experts to make the decision that is best for you. Becoming an RV owner can be a challenge, but it can also be the adventure of a lifetime. If you are undecided about buying an RV, rent one for a week or more and take a trip to see if the pros outweigh the cons. If you decide to step into RV living, check out the models offered by Airstream, Jayco, Tiffin, and Winnebago and you’re sure to find one that will be an excellent home for your adventures.